We have identified, for the first time in an adult, a case of hypokalemic paralysis associated with thyrotoxicosis and accompanied by GS. The aim of this report is to emphasize that hypokalemic paralysis could present with combined etiologies. A 35-year-old male patient was admitted to another hospital with complaints of weakness, fatigue and sweating. Laboratory tests revealed overt hyperthyroidism [Table 1]. Thyroid Doppler ultrasonography documented increased perfusion of the thyroid gland. Therefore, methimazole (20 mg/day) treatment was started. On the 15 th day of treatment, the patient presented to our clinic with extreme fatigue and difficulty in moving his limbs. Physical examination revealed body temperature of 37.2°C, heart rate of 88 beats/min, blood pressure of 120/80 mmHg and respiratory rate of 20/min. Upon neurological examination, a bilateral motor deficit of 2/5 in the upper extremities and 3/5 in the lower extremities was detected. There were no pathological reflexes, and sensory tests were normal. 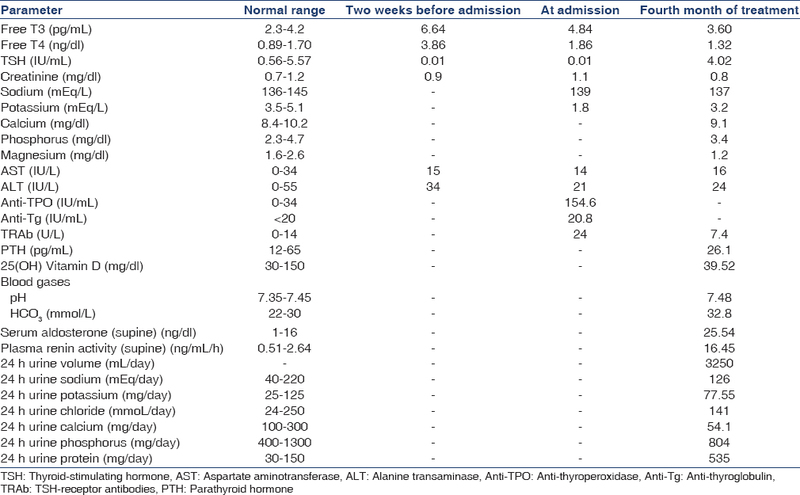 The patient's laboratory examinations revealed ongoing overt hyperthyroidism and hypokalemia, with high levels of anti-thyroperoxidase, anti-thyroglobulin, anti-thyroid stimulating hormone and thyroid receptor antibody (TRAb) [Table 1]. Intravenous potassium chloride (KCl) treatment increased the plasma potassium level to 3.8 mEq/L, and the patient's complaints subsided. He was prescribed oral KCl (2,400 mg/day) with a diagnosis of thyrotoxic hypokalemic periodic paralysis (THPP). During follow-up, oral KCl was continued. During the 4 th month of anti-thyroid treatment, euthyroid state was acheieved and the TRAb level was normalized; however, serum potassium levels were below 4 mEq/L. Investigations were performed to reveal the etiology of the hypokalemia, and metabolic alkalosis, hypokalemia, hypomagnesemia, hypocalciuria, and elevated renin and aldosterone levels were recorded [Table 1]. In the patient's past medical history, there was no evidence for drug use, including diuretics and laxatives. Due to the above findings, GS was considered. Molecular genetic analysis revealed a c. 1145C>T, p.Thr382Met homozygote missense mutation located on solute carrier family 12, member gene 3 (SLC12A3), exon 9. With the confirmed diagnosis of GS, spironolactone (50 mg/day) and magnesium oxide (250 mg/day) were added to the methimazole and oral potassium treatment. Renal biopsy was recommended for proteinuria and a screening genetic analysis was proposed for the family members at risk, but they did not accept it. Upon admission to our clinic, the patient was on methimazole treatment initiated previously due to thyrotoxicosis and he had overt hyperthyroidism and hypokalemia; therefore, THPP was considered the cause of the hypokalemic paralysis. However, during clinical follow-up, despite euthyroid status and potassium replacement, the hypokalemic condition persisted. GS was considered an accompanying condition requiring further examination, which revealed metabolic alkalosis, hypomagnesemia, hypocalciuria, and elevated renin and aldosterone levels. SLC12A3 gene analysis revealed the homozygote mutation, and the GS diagnosis was confirmed. Thyrotoxic hypokalemic periodic paralysis is a disease characterized by recurrent episodic muscle weakness in the presence of hypokalemia and thyrotoxicosis. It occurs predominantly in males of Asian descent. The thyrotoxic condition causes an ion channel defect leading to a rapid potassium shift to the intracellular space. In sporadic cases, Na + /K + -adenosine triphosphatase channel activation is responsible for this rapid shift, but in familial cases, the responsibility belongs to KCNE3 (voltage-gated potassium channel) gene mutation. In this case, the THPP gene was not analyzed because the past family medical history did not reveal any thyroid disease. Although in our case two simultaneous pathological mechanisms triggered hypokalemia, the patient's condition was not worse than expected with a single pathological condition. Clinical findings did not provide clues for a pathological condition other than thyrotoxicosis. In the medical literature, there is only one report describing hypokalemic paralysis, in a 16-year-old Japanese male patient, due to thyrotoxicosis accompanied by GS,  which differs from our case in the type of mutation. In our case, there was an SLC12A3 gene codon 382 (T382M) ACG > ATG homozygote mutation, while the Japanese case had an SLC12A3 gene 858 (L858H) CTC > CAC mutation. Patients with hypokalemic paralysis, investigations for etiology should be carried out and it is worthwhile to consider additional pathologies causing the hypokalemia, although thyrotoxicosis is in the foreground. Lin SH, Lin YF, Halperin ML. Hypokalaemia and paralysis. QJM 2001;94:133-9. Kung AW. Clinical review: Thyrotoxic periodic paralysis: A diagnostic challenge. J Clin Endocrinol Metab 2006;91:2490-5. Knoers NV, de Jong JC, Meij IC, Van Den Heuvel LP, Bindels RJ. Genetic renal disorders with hypomagnesemia and hypocalciuria. J Nephrol 2003;16:293-6. Vargas-Poussou R, Dahan K, Kahila D, Venisse A, Riveira-Munoz E, Debaix H, et al Spectrum of mutations in Gitelman syndrome. J Am Soc Nephrol 2011;22:693-703. Balavoine AS, Bataille P, Vanhille P, Azar R, Noël C, Asseman P, et al. Phenotype-genotype correlation and follow-up in adult patients with hypokalaemia of renal origin suggesting Gitelman syndrome. Eur J Endocrinol 2011;165:665-73. Berry MR, Robinson C, Karet Frankl FE. Unexpected clinical sequelae of Gitelman syndrome: Hypertension in adulthood is common and females have higher potassium requirements. Nephrol Dial Transplant 2013;28:1533-42. Imashuku S, Teramura-Ikeda T, Kudo N, Kaneda S, Tajima T. Concurrence of thyrotoxicosis and Gitelman's syndrome-associated hypokalemia-induced periodic paralysis. Pediatr Rep 2012;4:e18.